Bootstrap is a great front-end focused, free-to-use-framework that is mainly used for designing websites and applications. Launched back in 2011, it has evolved into a powerful and functional solution that is used on a range of websites worldwide as well as feature-rich applications for both iOS and Android. To build a custom template from scratch, you would have to hire an expert team of web developers and UI/UX & web designers, and shell out $10,000 for their services. Is it worth the trouble? Using Bootstrap-based web themes for site creation saves both cost and time. Moreover, there’s a wide choice of Bootstrap-based web themes from which you can choose and create a front-end for your own venture. Once you have decided on major functionalities that should be added to your site, you can start looking for a theme that is ideal for your project. However, make sure you look into the following 10 key features of Bootstrap templates which should be present in the template you select. Bootstrap has many different features that may appeal to users of different skill levels and backgrounds. The following 10 features will ensure your interface is easy to use, aesthetically pleasing and stands above your competitors. It’s easy to get started working with the framework, even though you have little to no coding skills at all. Owing to a wide selection of HTML and CSS templates, you can start working with Bootstrap quite easily. Select the right template that meets your expectations and professional needs, import it to your site, and start polishing off the ready-made blocks of your Bootstrap template. 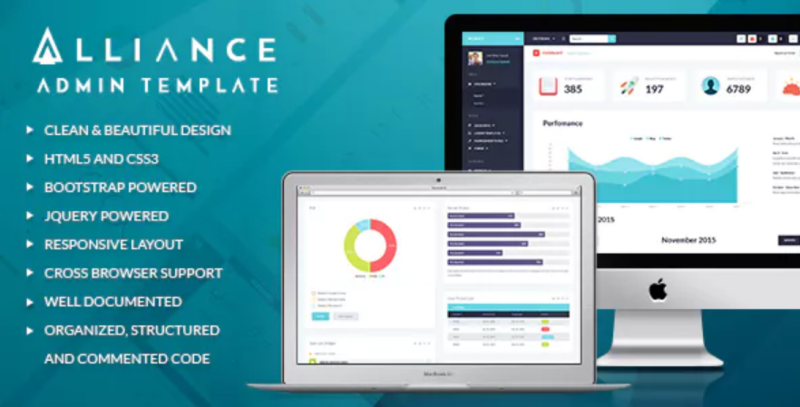 For example, by means of Alliance web theme, you can quickly create a fully-featured dashboard with the help of several homepage layout variations. It’s built with HTML5 and CSS3, thus providing you with a well-organized and clearly structured starting point for an exceptional presentation of your business project. You won’t face any sort or troubles when you need to integrate Bootstrap with any kind of a framework or platform that’s used on your website. In order to use it all on the same web page, simply download the file and link it up. You can also get similar results through hotlinking from Twitter, thus you can enjoy seamless integration with CSS and proceed with the habitual modification of your site’s structure. Bootstrap is equipped with a powerful 12-column fluid Flexbox-based grid system, which makes it impressively easy to use. With its help, your site can scale up and down to match different screen resolutions ideally. By means of the screen division into 12 columns, you can choose whether you’d like to group them all together or use individually. Hide different pieces of your site’s content or make it visible to your visitors by means of using necessary classes to phones, tablets, and desktops. Taking into consideration the growing demand in using handheld devices for web access, it’s important to make certain that all pieces of your site’s data will look equally well on different screen sizes. By means of Bootstrap framework, you can make your site mobile-friendly and more visible in search engines. It’s no secret that Google gives preference to those sites that are easy to browse on the go. Not having a responsive website means losing half of your audience and traffic. Bootstrap is responsive out-of-the-box. This makes the framework an essential element of all websites and web Apps that are intended to scale up and down to different screen sizes automatically. Bootstrap organizes all on-screen elements with the major consideration of available on-screen space. 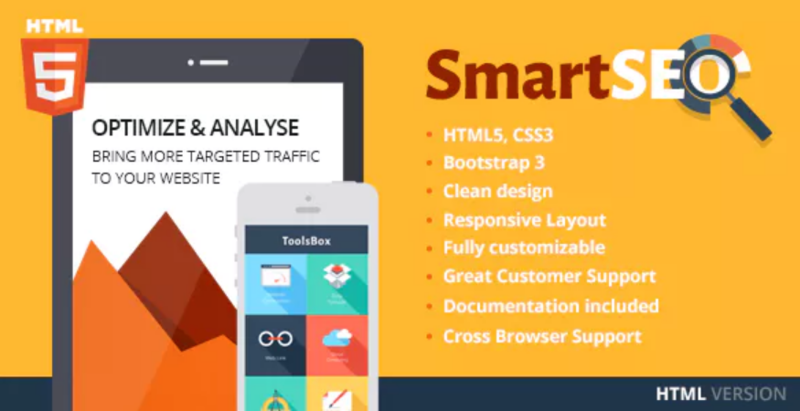 Take a look at Smart SEO HTML theme. Built with the valid code and last-generation web technologies in mind, it’s also optimized to display all pieces your data properly on a range of devices. Thanks to the ultra-responsive layout of the theme, you can lay rest to all your fears and create a mobile application for your SEO, marketing or advertising forms. Your website should look good in all devices and should support all popular web browsers. 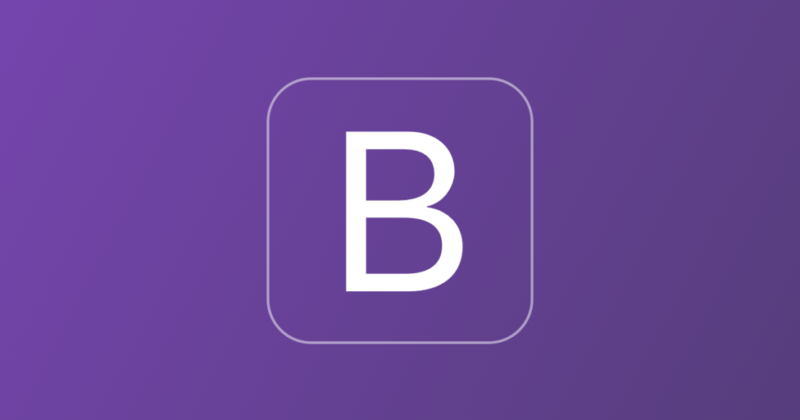 Bootstrap is compatible with all modern desktop and mobile browsers, thus letting you create websites that work equally well in all browsers, whether it’s Firefox, Chrome or Safari that people choose to access your page. Bootstrap delivers an impressive level of customization opportunities no matter what kind of project you are building. It’s one of the top reasons why the framework is so popular among web developers. It comes complete with everything needed to launch a professional design. However, when choosing a Bootstrap template, make sure you get rid of the features that you don’t need, thus making sure that you create a customized website featuring the essentials only. Take a look at the features delivered by Global Logistics template. 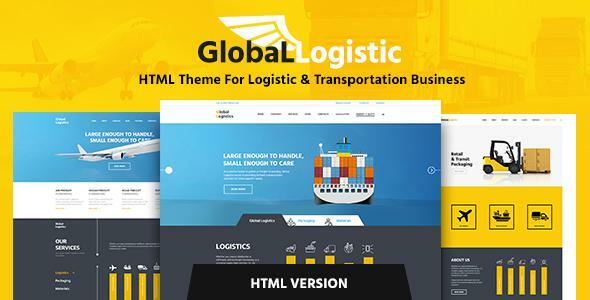 Serving as a quick and feature-rich starting point for logistics and trucking companies, the theme features a valid and clean code. Its responsive ad cross-browser compatible layout is powerful and lightweight. It’s fully customizable, letting you pick any accent color that matches your corporate identity. When creating an interface, you will need to include many different elements, from page headings, tables, anchors to buttons, and other things that you need to customize for a more impressive showcase of your project. With Bootstrap, you are provided with a wide choice of pre-designed elements that are both easy to understand and use. Bootstrap allows you to create customizable drop-down menus for your web pages, thus delivering effortless and easy-to-follow navigation patterns to your customers. The drop-down component is a fully responsive feature available in many Bootstrap-based websites. You don’t need to use lots of plugins to integrate the feature into your site. 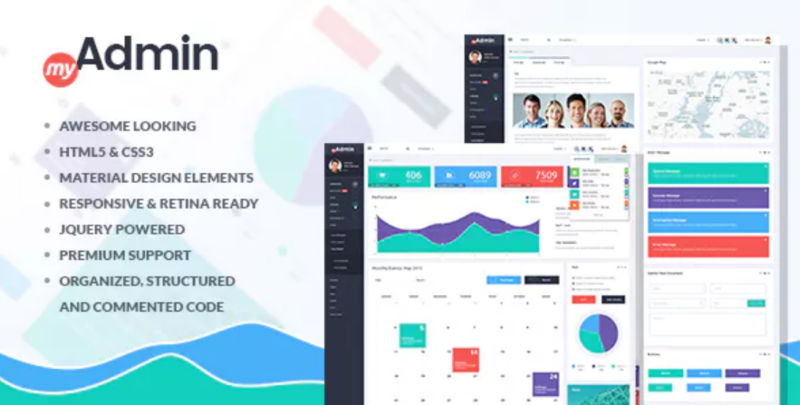 If you launch live demo of MyAdmin Bootstrap template, then you will see how masterfully the layout was integrated with the drop-down menu component. With its help, you can quickly switch between different sections and actions of your dashboard, which can significantly streamline your workflow. Bootstrap is proud to have one of the biggest communities of supportive designers and developers on the web. The framework delivers a number of updates of a range of features that you can include in your own web resource. Bootstrap is hosted on GitHub, where a community of about 1,000 contributors are ready to help you on a range of issues. Additionally, you can access a range of free and premium Bootstrap templates that can become quick starting points of your website creation. You can also benefit from impressive documentation with examples and demo that can be useful even to a newbie who wants to learn how to work with the framework. 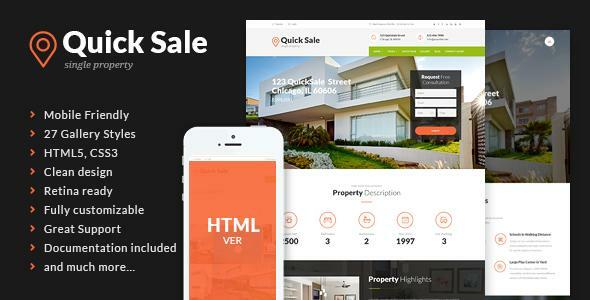 For example, downloading Quick Sale HTML template you receive a regularly updated web solution that will keep the dashboard of your real estate site always up-to-date and enhanced with the most innovative features. Additionally, you receive extensive HTML Documentation that will help you install and set the template properly. When you are just starting out with Bootstrap, it’s important not to get lost in the rich variety of Bootstrap design options, tools, and possibilities that the framework delivers to you. Bootstrap delivers literally limitless opportunities of competitive and functional sites creation. Bootstrap can be a great choice for beginners and expert webmasters alike. With its help, you can rest assured that all elements and components of your Webpage will look stunning on all devices and in all web environments. The huge community of designers and developers offers a rich diversity of premade Bootstrap templates that you can use to your own benefit. Cannot wait to get started? Breathe fresh air into your online project by means of premade Bootstrap themes. How much time does it take you to launch online? Don’t forget to share your achievements with us! Henry Rise is a CEO of ThemeRex, ThemeForest Power Elite Author. He loves to help people build their business online. Every business begins with the right choice of a micro-niche theme or template.